"Presenting the Annunciation, Incarnation and Birth of Jesus"
JESUS: HIS LIFE is an eight-part docudrama from The History Channel about the life of Jesus from the perspective of different people who knew him and encountered him, and Episode One focuses on Joseph. Episode One of JESUS: HIS LIFE contains some speculation and a couple skeptical comments from one scholar, but those comments are refuted by other people interviewed during the program, which contains dramatic scenes reflecting a strong Christian worldview and based on the Gospels of Luke and Matthew. JESUS: HIS LIFE is an eight-part docudrama from The History Channel about the life of Jesus, told from the perspective of different people who knew him and encountered him, and Episode One focuses on Joseph. Episode One of JESUS: HIS LIFE contains some speculation and a couple skeptical comments from one scholar, but those comments are refuted by other people interviewed during the program, which contains dramatic scenes reflecting a strong Christian worldview and based on the Gospels of Luke and Matthew. Episode One of JESUS: HIS LIFE is partly narrated by speculative comments from Joseph, who took Jesus as his own son, about Joseph’s own thoughts, but it also contains dramatic scenes showing the appearances of angels to Joseph and the Virgin Mary. In the episode, those appearances convince Joseph and Mary that Jesus is the Son of God conceived by the power of the Holy Spirit and the Messiah. Episode One also shows the Magi visiting King Herod the Great and the Baby Jesus. It ends with Joseph and Mary escaping to Egypt when they learn of Herod’s plans to kill Jesus. Interspersed with the dramatic scenes are short interview segments featuring scholars and Christian leaders discussing the events depicted in the New Testament documents. Episode One provides an excellent summary of the first few chapters of Matthew and Luke. The acting in the dramatic scenes is compelling. The episode does, however, contain some speculation about what exactly Joseph was thinking during the first chapters of the Gospels According to Luke and Matthew. In two other scenes, a scholar expresses doubts about the Roman Census mentioned in the Book of Luke and about King Herod’s order to send soldiers to kill Jesus mentioned in the Book of Matthew, but other people interviewed reject his skepticism. For example, King Herod is well known as a murderous tyrant, one man says, so there’s no reason to doubt Matthew’s account of Herod’s attempt to kill Jesus by ordering his soldiers to kill all the young boys in Bethlehem. Furthermore, research by MOVIEGUIDE® shows that, at the time of Jesus, Bethlehem was a small town with only 300 to 500 people living there, so the number of boys age two and below was, at the most, 10 to 20 children. Roman and Jewish historians probably would have no reason, then, to mention such a small albeit horrible event. Overall, therefore, the first episode has a strong Christian worldview and a high view of the biblical accounts about Joseph, Mary and the Baby Jesus. Hopefully, the other seven episodes will have the same attitude. MOVIEGUIDE® will keep readers and listeners posted. Naturally, of course, we encourage everyone to study the Bible and its historical background and meaning to get the full effect of the biblical text as God intends. A one-hour television episode can never totally replace the experience that an in-depth study of the biblical text can give. For instance, Joel Green’s commentary, THE GOSPEL OF LUKE (Eerdmans, 1997), makes for pretty in depth, fruitful studying. Joseph expresses doubts at first about Mary’s story of being visited by the angel Gabriel, and King Herod tries to fool the wise men, but they are “wise” to his schemes. 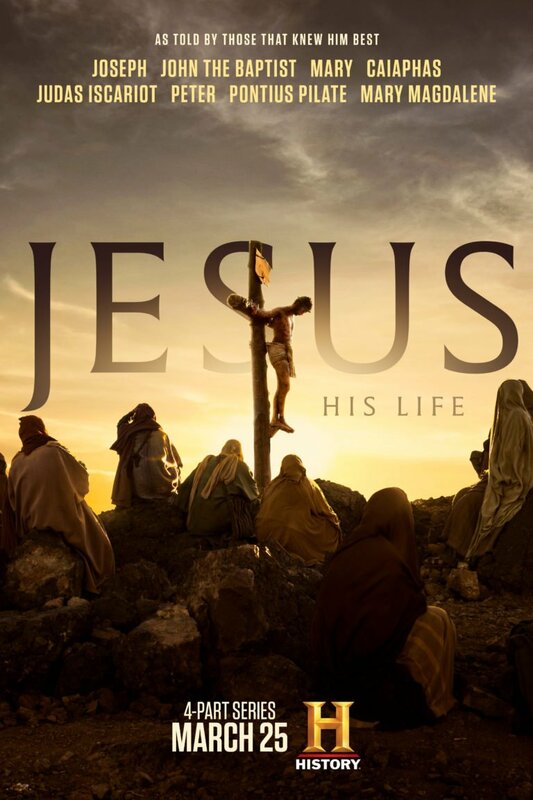 JESUS: HIS LIFE is an eight-part docudrama on The History Channel about the life of Jesus, told from the perspective of people who knew Jesus. Episode One focuses on Joseph. It contains some speculation about what Joseph was thinking during the first chapters of the Gospels by Luke and Matthew. Also, dramatic scenes show the appearances of angels to Joseph and the Virgin Mary. Those appearances convince them that Jesus is the Son of God conceived by the power of the Holy Spirit. Episode One also shows the wise men visiting King Herod and Baby Jesus. It ends with Joseph, Mary and Jesus escaping to Egypt when they learn of Herod’s plot to kill Jesus. Finally, Episode One contains short interview segments featuring scholars and Christian leaders. Episode One provides an excellent summary of the first few chapters of Matthew and Luke. One scholar expresses doubt about a couple minor historical points, but other interviews refute his skepticism immediately after his two comments. Overall, therefore, Episode One of JESUS: HIS LIFE has a strong Christian worldview and a high view of the Bible.